Tall, dark, beautiful and belligerent-looking, Nan Hall Linke’s doll is a maiden who became a warrior. A psychotherapist with spiritual focus, Linke has no trouble imagining such a metamorphosis. Her interior world is ripe with dreams, symbols, archetypes and adventure. Through leading and teaching group classes in ritual, she helps others to quest: coaxing, encouraging, even goading people to open doors inside themselves. Like her students, who sometimes return class-after-class, Linke views ritual as a way to transcend reason, access the spiritual and bring change. So she easily accepts the doll’s transformation as related by the dollmaker. The doll reminds Linke of her own journey. She is a guide on a literally purple path of spiritual growth. That purple path, a thick roll of plastic meant for crafts projects and outdoor tablecloths, sometimes winds through Linke’s sun-kissed garden and patio. Tentative pilgrims sit on it. Seekers stalk unnamed goals on it. The weary rest and reflect before starting anew. But start again they must. As she teaches, Linke likens ritual to “the soul’s thereafter,” a longed-for arena freeing the psyche to plumb its depths so the person may intuitively follow where he or she feels led. Her perspective is reflected among many contemporary thinkers. Christian theologians highlight the value of the church’s transforming rituals. From the community emphasis of Holy Communion to the joining of two individuals in the marriage service, ritual weaves through church history and practice. Among Jews, the home-based rituals of such holidays as Passover are enjoying a rebirth as non-observant Jews embrace them with new fervor. Other religions from Hinduism to Islam are experiencing similar rejuvenation. African-American churches hold rites of passage for young boys to strengthen their sense of responsibility at manhood. Women’s groups revamp and rewrite traditional religious ritual to find new meaning in patriarchal traditions. Evangelicals convert to Eastern Orthodox churches, seeking God’s mystery and majesty as symbolized in the tradition’s worship. Even people with little or no religious ties are finding new meaning in ritual. In San Francisco and Houston seekers walk labyrinths, reenacting ancient searches. In Philadelphia last weekend, black women marched to affirm their solidarity. There are books on rituals for sacred living, walking for reflection, painting to unlock creativity and meditation to access inner silence. “At its most intense, ritual leads us into worlds not realized and becomes sacred,” British director and writer James Roose-Evans argued in Passages of the Soul, Ritual Today (Element, $19.95). Yoga teacher Moira Martin took her first ritual class with Linke seven years ago. Soon afterward, she returned to college to finish her bachelor’s and master’s degrees. She confronted personal loss when her mother died. In each instance, ritual was a path to change and freedom. In classes with Linke, Martin made a compass, a magnet and a clock, emblazoning each with what became holy symbols in her life. Later she made dream pillows, painting haunting faces, abstract images and landscapes on them. She now sells them and makes them for friends. Composer and pianist Anita Kruse discovered ritual linked her to her dreamworld, childhood and inner creativity in her first class with Linke five ears ago. In her first class with Linke five years ago. In her first ritual, she sewed multicolored fabric and other items onto a blue jean jacket, creating a ceremonial garment. While Martin found ritual helped link her to Irish ancestors, Kruse felt herself recovering something much older, a distinctly feminine sense of the sacred. Reared in a military family, she never felt grounded in a place. Ritual linked her, strengthening her musical skill and creativity. Linke, trained in traditional psychotherapy and in the approach of C.G. Jung, teaches that ritual comes naturally to children. They collect things, bury things, throw things up in the air. Work, play, school, even sleeping, may involve ritual for a child. Following natural instincts, a little boy refuses to go to bed without a beloved toy. A little girl insists on wearing a certain outfit on a particular day. During each four-week ritual class, Linke is amazed at the paths students choose. Many begin with a few symbols of their quests and a hazy idea, or no idea, of where seeking will take them. 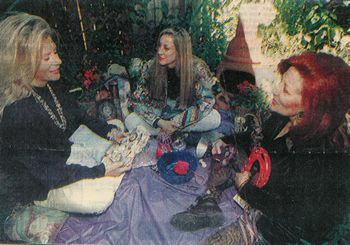 Sitting cross-legged on her patio atop part of the purple path, Linke smiles as she recalls the memories. One student with a number of advanced degrees longed to understand where they might lead her. She laid the degrees in front of her, one after another and used them as a path in her ritual. Another imagined her financial struggles as though she were running a marathon. She tacked money all over her shoes in her ritual.